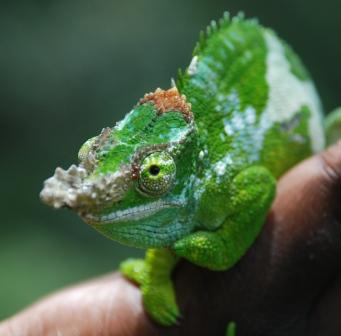 Chameleon are highly unique & distinctive lizards, possessing the ability to change their color, which serves as a mean for their communication, reflects their mood, temperature & as a mechanism to sway away the predators. Another extra ordinary ability they possess is, they are able to move their eyes independently of each other & thus see two different images from their respective eyes. They are found in forests of Madagascar, Africa, Yemen, Spain and India. Their diet includes snails, spiders, fruits, berries. Their average life span is 5-9 yrs, depending upon the species. Have a look at the following video & get amazed by their awesome ability of changing colors & that too quickly.